Original Australian Classic Mini R&B ugg boots made in Australia from genuine Australian double faced sheepskin. Buy online here, select required options, add to cart, proceed to our secure checkout and pay with PayPal, credit card, debit card OR buy at our SYDNEY FACTORY OUTLET where you can get FREE pair with BUY 3 GET 1 FREE special offer and save up to $200 or get $10 cash discount for each pair paid by cash. I live in Albania, Europe. i have order one pairs black, one friend of mine have buy them, i am in love with them very comfortable, such amazing! unique and stylish! 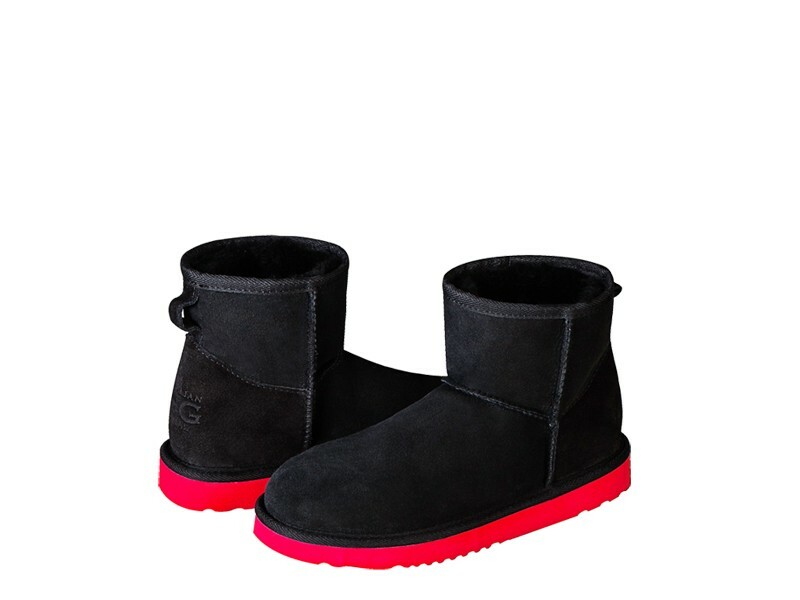 love my BLACK AND RED ugg!! A wonderful site with great quality boots and uggs, super cute uggs. That's what everyone must have this winter!!! Stunning model, great shape, excellent quality and AUSTRALIAN origin!!! Extremely hard to find a real AUSTRALIAN MADE uggs )))) Highly recommend! I purchased R&B mini online and they are wonderful!! absolutely stunning boots!! ordering, delivery and everything were easy and prompt! Would use you again definitely. Love the quality and have been happy with everything I have brought of here! Just wish they didn't run out of stock so quick! Ordered the Classic mini RB for a gift, I found it to be the best product!! Excellent !!! Excellent quality! Australian quality! R&B Red and black boots (super fashionable!) - ordered online and arrived the following day. Good value, speedy delivery. Recommended. A tous les acheteurs français. Vendeur très sérieux. Objet conforme à la description reçu dans la semaine en France via la Poste. Prix imbattable. Je recommande ce site. Merci encore. BRAVO!! GREAT QUALITY AND FAST DELIVERY! BRAVO AGAIN! I just adore AUSTRALIAN UGG ORIGINAL! The quality is fantastic and different from other ugg online shops. Exactly my style. The colour range is very good and customer service is really helpful. I am very happy with this wonderful shopping. Thank you very much! Amazing uggs, love the quality, great service, fab product. Would shop here all the time if I could! perfect shape uggs are the best and last for ever i highly recomened them! thank u so much for reading! Good website, good service & delivery and very pleased with my purchase! Fantastic quality and very stylish model! Red sole is absolutely unique!!! Absolutely in love with my new uggs!! standout mix of black and red - very individual!! Never seen before such fashionable and great quality uggs! absolutely 5 stars product! Will definitely be back! Everything was perfect. From order to shipment and right delivery in 4 days (Denmark). Thanks! obviously highly recommended! One of the easier sites to order through. The quality is one of the best I have found. Very impressed! In all honesty, Ive never heard of the company. I was looking for a ugg, so I googled what i wanted, and ... I took the risk and bought the product. They came next week which was brilliant! Thank you for great service and good quality! Highly recommend this company. Beautiful products, good prices and absolutely nothing that's not a positive. As for R&B they are so fashionable and unique!!! I really recommend this style of shoes, it is light in weight, very comfortable, and it is very stylish, chic and fashionable! definitely "must have"
I even wear it inside the house. Well, I've got the best Valentine Day Gift!!! Thank you so much, Max! Love you! Ohh I love this great mix - black boots and red sole! Perfect quality of boots, very secure and fast shipping, true to size! I have a lot of compliments! Thank you AUSTRALIAN UGG!! These boots are amazing!They are definitely must have product!! Unique! These are such great shoes! They are just wonderful. Absolutely A LA MODE! And they were worth every penny!! they are so stylish and comfortable too. I HIGHLY recommend these. TO ANYONE.